The 33-year-old speaks to STV about passion for the Nerazzurri. 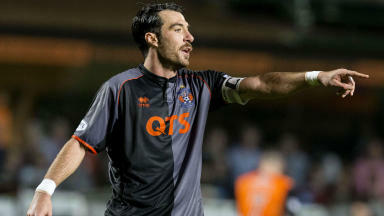 Kilmarnock captain Manuel Pascali will be keeping a keen eye on how events unfold at the San Siro on Thursday as Celtic aim to progress to last 16 of the Europa League. The self-confessed Inter fanatic was at Celtic Park for the six-goal thriller last week and is expecting more drama tomorrow night. A young Pascali and his brother picked up their passion for the Nerazzurri from their mother with their father following Juventus and Lecce. As he explains "you can change your girlfriend, your wife but you cannot change your football team"
So just how passionate is the Killie ace? Can he name the Inter team that won the Scudetto in 1989, when he would have been just eight years old? STV’s Raman Bhardwaj spoke to him about his love for Inter, his take on Mancini's team and who he thinks will make it through to the next round.